For the 2002 Hey Arnold! film, see Hey Arnold! : The Movie. Hey Arnold! 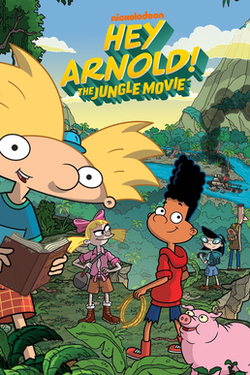 : The Jungle Movie is a 2017 American animated television film based on the Nickelodeon series Hey Arnold!, which was created by Craig Bartlett and originally aired from 1996 to 2004. It follows the 2002 film Hey Arnold! : The Movie and the two-part Hey Arnold! episode "The Journal". During the summer after their fifth grade year, Arnold (Mason Vale Cotton) and his best friend Gerald (Benjamin Flores Jr.) plan to make a humanitarian video to win a trip to San Lorenzo, where Arnold's parents were last seen. They try to record themselves making a home out of junk for one of their friends, eccentric Monkeyman (Craig Bartlett), but it backfires, leaving Arnold heartbroken. Helga (Francesca Marie Smith), who secretly has a longtime crush on Arnold, uses various footage she's compiled over the years showing Arnold's good deeds, and everyone in town surprises Arnold with the video. Arnold's teacher Mr. Simmons (Dan Butler) reveals to everyone that Arnold's video won the competition and he, his classmates of P.S. 118, and Helga's older sister, Olga (Nika Futterman) fly to San Lorenzo. While on the plane, Arnold's pet pig Abner (Bartlett) stows away in his backpack. When everyone arrives in San Lorenzo, they are greeted by Arnold's parents' old friend, Eduardo. Aboard a ship, Eduardo privately warns Arnold of the jungle's dangers and gives him an amulet said to lead them to the "Green-Eyed People", the residents of San Lorenzo's lost city. Later that night, Helga tries to confess her feelings to Arnold, but the boat is attacked by pirates. After learning the secret that Arnold kept from them, Gerald and the others shun him. When the group reaches a base camp, Eduardo reveals himself to be a mercenary named Lasombra (Alfred Molina), who disguised himself as Eduardo to deceive Arnold and the others. He and his men imprison everyone, explaining that the contest was a trick to lure Arnold to San Lorenzo so he could use him to find the lost city and its treasures. Helga and Gerald manage to escape and free Arnold, and use Arnold's father's old journal to find the city; unbeknownst to them, Lasombra anticipated this and placed a tracking device on Arnold's green eyed necklace. Arnold and his friends manage to evade the lost city's traps, while Lasombra pursues them, sacrificing most of his men to the traps. Meanwhile, Abner escapes and makes it back to Arnold's grandparents, Grandpa Phil (Dan Castellaneta) and Grandma Gertie (Tress MacNeille), who see this as a sign that Arnold is in trouble. The two meet with Helga's parents Big Bob (Maurice LaMarche) and Miriam (Kath Soucie) at the airport, who had received an SOS message from Helga's intelligent best friend, Phoebe (Anndi McAfee). The group flies a rental plane to San Lorenzo, where they help the other kids defeat Lasombra's gang. Arnold and the others reach the city, finding it populated by children due to a "sleeping sickness" that has left its adult population comatose for nine years. The group finds a statue said to contain the Corazón, a treasure that may lead to a cure for the sickness. Lasombra corners them, taking Arnold hostage and stealing the statue. While Gerald and Helga give chase, Lasombra forces Arnold to open the statue using the amulet. When Lasombra tries to take the Corazón within, the statue's defense system shoots him in the forehead with a poisoned dart, sending Lasombra over a cliff. A mysterious man arrives and reveals himself to be the real Eduardo (Carlos Alazraqui), who explains that the pirate "attacking" them earlier was him trying to rescue the group from Lasombra. Lasombra climbs back up from the cliff and gets into a brief scuffle with Eduardo, knocking the Corazón off the cliff, before succumbing to the poison and plummeting to his death. The group returns to the city, and Arnold finally sees his parents, Miles (Bartlett) and Stella (Antoinette Stella), who have also contracted the sleeping sickness. Without the Corazón to release the cure to the infected population, Helga uses her locket containing a photo of Arnold as a replacement. The temple releases the cure and the infected are revived. Arnold and the city's children reunite with their parents. Arnold thanks Helga for her loyalty and finally realizes the depths of her feelings for him, and the two share a kiss. A few months later, life as normal has resumed at Arnold's grandparents' boarding house, though now with Miles and Stella living there as well. Arnold says goodbye to his parents as he heads off for his first day of sixth grade with Gerald, Phoebe, and Helga. Gerald and Phoebe are seen holding hands walking to school together, while Arnold and Helga are also implied to be a couple despite Helga pretending to remain hostile towards Arnold in public. Arnold's parents walk with him and his friends to school and Arnold promises his mom and dad that they'll see him at 3:30 as the doors close behind him. The voice cast for the film is made up of 20 actors from the original series, and 11 new cast members to replace former actors who retired, grew up, or died. In 1998, when Nickelodeon renewed Hey Arnold! for a fourth season, they offered series creator Craig Bartlett a chance to develop two feature-length films based on the series: one as a TV movie or direct-to-video, called Arnold Saves the Neighborhood, and another slated for a theatrical release. Nickelodeon asked Bartlett to do "the biggest idea he could think of" for the theatrical film. After looking at the series, Bartlett decided to make the theatrical feature as a spiritual sequel/follow-up to the Season 5 episode "Parents Day", and have Arnold try to solve the question of what happened to Miles and Stella, his parents. This became known as Hey Arnold! : The Jungle Movie. In 2001, executives at Nickelodeon and Paramount decided to give the made-for-TV movie Arnold Saves the Neighborhood a theatrical release instead in 2002, under the title of Hey Arnold! : The Movie to attract the attention of the public, after successful test screenings. Around this time, Nickelodeon also asked Bartlett to produce a special one-hour "prequel" episode called "The Journal" that would serve as a lead-in to the second movie. The episode aired on Nickelodeon on November 11, 2002. However, Hey Arnold! : The Movie received mixed to negative reviews and grossed $15.2 million worldwide, resulting in the cancellation of The Jungle Movie and leaving Hey Arnold! with an unresolved cliffhanger ending. During subsequent years, Bartlett shared many details, characters and plot points of the movie; however, he did not reveal any significant spoilers in the event that the movie might someday get made. Around 2009, many fans started online petitions to convince Nickelodeon to greenlight The Jungle Movie. In 2011, reruns of Hey Arnold! on TeenNick's late-night classic Nickelodeon programming block NickSplat increased public attention in the series and its cancelled movie. In October 2012, Craig Bartlett revealed that he was back at Nickelodeon having meetings with them. In December 2014, it was revealed that Craig Bartlett and Nickelodeon's executives were interested in reviving Hey Arnold!. In September 2015, Nickelodeon announced officially during an interview with Entertainment Weekly that they were considering reviving many of their old properties, and that Hey Arnold! was one of them. On November 23, 2015, Nickelodeon reported that they were working on a Hey Arnold! TV movie that would answer all the fans' questions, including the whereabouts of Arnold's parents, with Bartlett set to write and produce. On March 1, 2016, it was announced that the film would be released in 2017. The next day, Bartlett confirmed officially that the TV movie would be The Jungle Movie and that it would be released as a two-hour TV movie. According to Bartlett, the story of The Jungle Movie was originally written and produced between 1998 and 2001 by Steve Viksten, Jonathan Greenberg and himself. Storyboards were drafted by Raymie Muzquiz and test footage was produced. In the years following the film's cancellation, Bartlett confirmed many plot points of the film, like the revelation of Arnold's name during the opening sequence and that Arnold still had the map of the jungle of San Lorenzo that he found in "The Journal". He also revealed that Lasombra was searching for La Corazón, a fabulous jewel and sacred relic of the Green-Eyed people, the tribe that Miles and Stella helped in the past. Helga's and Arnold's relationship would also take a next step, after Helga kissed Arnold in the climax of the Hey Arnold! : The Movie. Craig Bartlett mentioned in an interview that The Jungle Movie was the first thing he pitched when he came back to Nickelodeon. In June 2016, Bartlett confirmed that the TV movie was written to take place with the kids going into the fifth grade, one year after the ending of the original series. In July 2016, Variety showed various artworks of the main characters. As revealed in a promo during the NickSplat premiere, the script for the film was originally twice as long. One particular gag that was cut was the parade sequence in San Lorenzo in which Olga appears on a parade float, and Helga appears on another dressed as a monkey. In the final version, there is only a very brief shot of the parade. On June 13, 2016, it was reported that Francesca Marie Smith, Anndi McAfee, Justin Shenkarow, Olivia Hack, Nika Futterman, Dan Butler, Dan Castellaneta, Tress MacNeille, Antoinette Stella, Carlos Alazraqui, Dom Irrera, Maurice LaMarche, Kath Soucie, Danielle Judovits, Danny Cooksey, Jim Belushi and Hey Arnold! creator Craig Bartlett himself were attached to reprise their respective roles as Helga, Phoebe, Harold, Rhonda, Olga, Mr. Simmons, Grandpa, Grandma, Stella, Eduardo, Ernie, Bob Pataki, Miriam, Big Patty, Stoop Kid, Coach Wittenberg and Miles; while Lane Toran and Jamil Walker Smith, the original voices of Arnold and Gerald, were attached to return, but as the voices of San Lorenzo tour guides, while being replaced by Mason Vale Cotton and Benjamin Flores, Jr. respectively; and Alfred Molina was cast as Lasombra, the film's main antagonist. The next day, it was reported that Gavin Lewis, Jet Jurgensmeyer, Aiden Lewandowski, and Laya Hayes were respectively cast as Eugene, Stinky, Sid and Nadine. On July 10, 2017, Nickelodeon released an "exclusive first look" at the new character designs narrated by Bartlett. Eleven days later, on July 21, to coincide with the Hey Arnold! panel at San Diego Comic-Con, a short scene from the film was released, in which Arnold is presented with a special film about all the good deeds he has done for his neighborhood. The film's official trailer was released on October 6, 2017. An additional trailer was released on the NickSplat YouTube channel on November 7, 2017. During the month of November, NickSplat (a programming block on TeenNick that regularly features the series) aired Hey Arnold! episodes every night from 12:00 to 1:00 AM (ET/PT). From November 17 to 24, NickSplat aired a marathon of all the episodes of the series, nightly from 12:00 to 6:00 AM (ET/PT). The film premiered on YTV in Canada on January 5, 2018, and had a limited theatrical premiere in Australia during February 2018 exclusively to Hoyts cinemas, before airing on Nickelodeon Australia on March 2, 2018 and probably coming soon on 9Go!. On March 9, 2018, the film received a one-day limited release at select Showcase Cinemas locations in the United States. The television film was released on DVD in Region 1 on February 13, 2018 by Paramount Home Entertainment. It was then released on DVD in Region 2 on August 13, 2018 by Paramount Home Entertainment. The A.V. Club graded it with an "A" complimenting the film for preserving the original series' "warm tone and careful pacing, its willingness to let its young characters absorb dramatic moments and contemplate within silences." IGN.com gave the film a score of 7.5 out of 10, noting "the little, unexpected homages to what made Hey, Arnold! such a joy originally that mark the high points of The Jungle Movie." Den of Geek's Shamus Kelly gave it a score of 3 out of 5, giving a more decidedly mixed opinion of the film, praising the opening moments of the film but criticizing the scenes in San Lorenzo. The original broadcast of the movie was watched by 1.63 million total viewers when it premiered on Nickelodeon with simulcasts on TeenNick and Nicktoons. On Nickelodeon, the movie leaked into Nick at Nite, causing the ratings to be reported separately for each hour of the film, since Nielsen considers Nick at Nite a separate network despite being on the same channel. The combined average was 1.27 million total viewers, with 1.39 million total viewers for the Nickelodeon hour and 1.15 million total viewers for the Nick at Nite hour, with an average 0.4 rating in the 18-49 demo. On TeenNick and Nicktoons, the movie was watched by 0.13 million total viewers and 0.23 million total viewers, respectively. ^ "Hey Arnold! movie could lead to a new season, if all goes well". Polygon. October 6, 2017. Retrieved October 9, 2017. ^ "Nickelodeon Reveals Title of the Hey Arnold! TV Movie as Hey Arnold! : The Jungle Movie; Original Voice Actors Return - Nick Press". ^ "Wally Wingert on Twitter". ^ Jackson, Dallas. "NYCC2017 Panel Recap: Hey Arnold!". ComicBook.com. Retrieved October 6, 2017. ^ "The Trailer and New Art for Hey Arnold! : The Jungle Movie". Comingsoon.net. ^ "Interview With Hey Arnold's Craig Bartlett". Apocalypstick. Retrieved September 24, 2016. ^ "Craig Bartlett's Return To Nickelodeon In 2012". YouTube. July 29, 2017. Retrieved July 29, 2017. ^ "Craig Bartlett Discusses Hey Arnold! Returning To Nickelodeon". YouTube. February 23, 2015. Retrieved September 24, 2016. ^ Christopher Hooton (September 3, 2015). "Hey Arnold! is coming back, and possibly Rugrats too". The Independent. Retrieved September 24, 2016. ^ Brian Steinberg (November 23, 2015). "'Hey Arnold' Movie in Works, Nickelodeon Reviving Shows". Variety. Retrieved September 24, 2016. ^ Rife, Katie (November 23, 2015). "Nickelodeon is making a Hey Arnold! movie, might bring back other classic series · Newswire · The A.V. Club". Avclub.com. Retrieved September 24, 2016. ^ Brian Steinberg (March 1, 2016). "2016 TV Upfront: Nickelodeon To Revive 'Legends of the Hidden Temple'". Variety. Retrieved September 24, 2016. ^ Swift, Andy (March 2, 2016). "'Hey Arnold: The Jungle Movie' Confirmed — Coming To Nickelodeon 2017". TVLine. Retrieved September 24, 2016. ^ "Confirmed Notes About "The Jungle Movie" | Hey Arnold! – A Critical Analysis". Tendraheyarnold.wordpress.com. Retrieved September 24, 2016. ^ McClendon, Lamarco (July 28, 2017). "Hey Arnold! creator Craig Bartlett chats with us about the show's revival". ^ Caitlyn Hitt. "'Hey Arnold: The Jungle Movie' Plot To Reveal The Truth About Arnold's Parents". Ibtimes.com. Retrieved September 24, 2016. ^ McClendon, Lamarco (July 21, 2016). "First Images of 'Hey Arnold! : The Jungle Movie' Unveiled". ^ Swift, Andy (June 13, 2016). "'Hey Arnold! The Jungle Movie' — Original Cast Returns To Nickelodeon". TVLine. Retrieved September 24, 2016. ^ Evry, Max (June 13, 2016). "Hey Arnold! : The Jungle Movie Voice Cast Announced". Comingsoon.net. Retrieved September 24, 2016. ^ Eakin, Marah (June 13, 2016). "Exclusive: Hey Arnold! movie gets a name, hefty slate of returning voice actors · Newswire · The A.V. Club". Avclub.com. Retrieved September 24, 2016. ^ Snierson, Dan (June 13, 2016). "Hey Arnold movie: Nickeloden announces title, 19 original actors returning". Ew.com. Retrieved November 27, 2017. ^ Nickelodeon (July 10, 2017). "Hey Arnold: The Jungle Movie | Exclusive First Look | Nick". YouTube. Retrieved July 21, 2017. ^ Nickelodeon (July 21, 2017). "SDCC 'Hey Arnold: The Jungle Movie' Sneak Peek | The Legend of Arnold | Nick". YouTube. Retrieved July 21, 2017. ^ Marc Snetiker (July 21, 2017). "New Hey Arnold! footage reveals fan-favorite character returns". Entertainment Weekly. Retrieved July 22, 2017. ^ Keely Flaherty (October 6, 2017). "The New "Hey Arnold" Movie Trailer Will Make You Feel Every Emotion On The Spectrum". BuzzFeed. Retrieved October 6, 2017. ^ Dave Trumbore (November 8, 2017). "New 'Hey Arnold! : The Jungle Movie' Trailer Promises to Answer All Your Questions". Collider. Retrieved November 14, 2017. ^ "Arnold and crew are back in nickelodeon's hey arnold! : the jungle movie premiering friday". Nickelodeon Press. Archived from the original on November 29, 2017. Retrieved November 29, 2017. ^ Ryan Vo (December 19, 2017). "YTV: Hey Arnold! : The Jungle Movie Promo (2017) (30 sec)". YouTube. Retrieved January 1, 2018. ^ "HEY ARNOLD! The Jungle Movie". HOYTS. ^ "10 Years of Event Cinema". Showcase Cinemas. Retrieved May 18, 2018. ^ "Hey Arnold! - 'The Jungle Movie' TV Film is Already Scheduled for DVD in 2018!". TV Shows on DVD. December 14, 2017. ^ Johnson, Kevin (November 22, 2017). "Even in the wilds of The Jungle Movie, Hey Arnold! rarely loses sight of its heart". A.V. Club. Retrieved November 27, 2017. ^ Dornbush, Jonathon (November 24, 2017). "HEY, ARNOLD! : THE JUNGLE MOVIE REVIEW". IGN.com. Retrieved November 27, 2017. ^ Kelly, Shamus (November 25, 2017). "Hey Arnold! : The Jungle Movie Review". Den of Geek!. Retrieved November 27, 2017. ^ Mitch Metcalf (November 28, 2017). "Top 150 Friday Cable Originals: 11.24.2017". Showbuzz Daily. Retrieved January 1, 2018. ^ Pedersen, Erik (August 28, 2018). "Emmys: 'Broad City', 'The Simpsons' & 'Adventure Time' Among Juried Winners". Deadline Hollywood. Retrieved August 28, 2018. This page was last edited on 23 April 2019, at 18:16 (UTC).